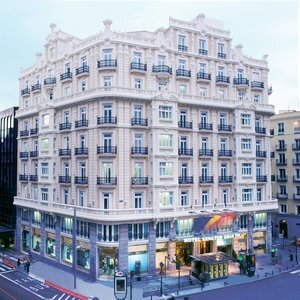 Fully in the heart of Gran Via, the hotel is placed in the leisure area of the city, near theatres, cinemas, museums, parks etc. Very close to Cibeles Square, Sun's Gate and Recoletos Avenue. It provides public transport to hotel gate. It has 136 guestrooms perfectly soundproof, bed quilts, and fitted lamps. Satellite TV, free mini bar (non alcoholic drinks) and free safe box, wardrobe with ironing board and flat iron, coffee maker. Furthermore, the rooms have reclining armchairs and beds according to the type of the room. The hotel provides non smokers floors. Its facilities are completed by restaurant, great buffet breakfasts, public parking just 200 metres away, free Wi-Fi everywhere in hotel, business centre (up to 20 people). NOTICE: it accepts neither American Express, nor Diners Club. The hotel does not accept name on reservations that cannot be cancelled.